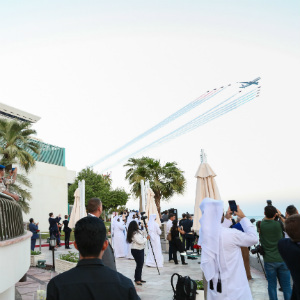 DOHA, Qatar, 2017-Oct-02 — /Travel PR News/ — Thousands of people watched in admiration as a Qatar Airways aircraft flew in formation over Doha with the world-famous Red Arrows aerobatic display team, an event taking place as the airline celebrates its twentieth anniversary. This entry was posted in Airlines, Airports, Entertainment, Festivals and Events, Flights, Travel, Travel Management, Travel Services and tagged Air Display, His Excellency Mr. Ajay Sharma, His Excellency Mr. Akbar Al Baker, Qatar Airways. Bookmark the permalink.